Ever since the massive re-birth of the Oregon Ducks football program under Chip Kelly, things have been steady. What Kelly did for the program seemed like the right move at the time, and it was. But who would have thought this success would have carried over the next few years? The Ducks’ offense is one of the most high-powered in the entire country. The coaches understand how to implement a successful game plan with the talent available. 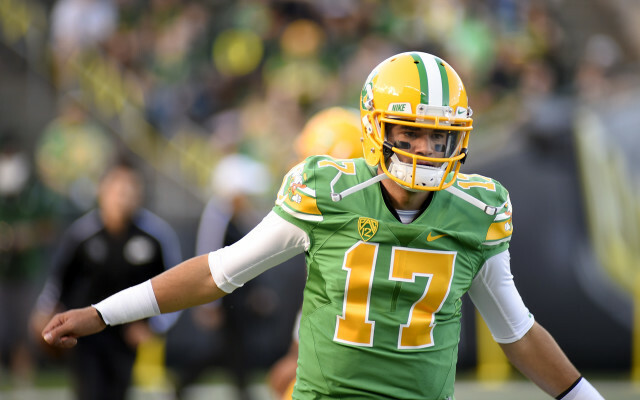 Though it is still unclear as to who will start at quarterback come week one, the talent around the quarterback this season will be unlike any other Ducks roster from the past. 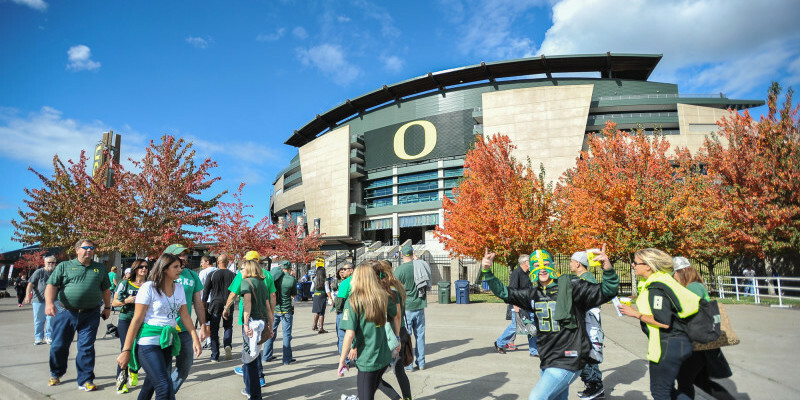 As we delve into the potential starters for week one, do keep in mind that the Spring Game, which is to be played on May 2 at Autzen Stadium, could really shake things up. Royce Freeman — a future Heisman contender. 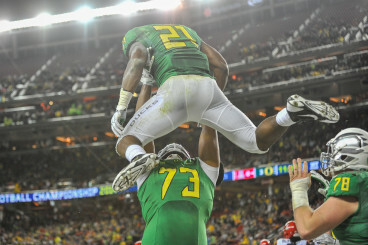 The duo in the backfield for the Ducks might end up being more successful than Kenjon Barner and LaMichael James. Royce Freeman, the ultimate Mr. Reliable, has brute strength and size that is rare to see in a kid going into his sophomore season. Behind him, but still contending for the starting role, is Thomas Tyner. Should Tyner start week one, it would be surprising, but the kid has so much talent that he would most likely start for any other major program — just goes to show how good Freeman truly is. Keep an eye out for this tandem, as they combined for close to 2,000 yards last season. The future is certainly bright for these two, and don’t be surprised if head coach Mark Helfrich moves to a more run-based offense this season. When you don’t have enough spots for all the talent on your team, that is a good issue to have. With the return of Bralon Addison, to go along with Darren Carrington, Dwayne Stanford, Devon Allen, Byron Marshall, and standout freshman recruit Alex Ofodile, the sky is the limit for these guys. Even with the quarterback position still up in the air, the amount of talent the Ducks have will make opposing defensive coordinators sick. Baylis will be a great college tight end. By now, everyone is very aware of the potential career-ending injury that Pharaoh Brown suffered last season against Utah. Losing Brown took one of the best tight ends out for the season, and made things tough for Mariota and the Ducks. While Brown has been posting on his social media site recently, claiming that he will play football again, it’s hard to tell when that would be. In the meantime, the Ducks have Evan Baylis, who performed very well in the absence of Brown. Baylis is an athletic guy, standing in at 6’5″, and weighing in excess of 250 pounds. With more playing time being inevitable, Baylis will have a shot to prove that he has what it takes to be a consistent tight end in college. Johnstone, a true veteran, is returning to the field. Last season was highly successful for the offensive line, but it didn’t come without its struggles. Before the season started, projected starting tackle Tyler Johnstone was ruled out due to a knee injury. Also suffering injuries were Hroniss Grasu and Jake Fisher. With Johnstone returning in healthy form, the offensive line has its leader back. Along with Johnstone, who will most likely start at left tackle, we could be looking at the following unit: Jake Pisarcik (guard), Doug Brenner (center), Matt Pierson (guard), and Tyrell Crosby (right tackle). Though this unit has never collectively played together, overall size and experience will show that this group can be successful. Lockie has experience with the Oregon system, but will it be enough to lock down the starting QB gig? Saving the best for last, the quarterback battle will be one of, if not the most, important battles in recent Ducks history. Filling the void that Marcus Mariota left will not be easy. 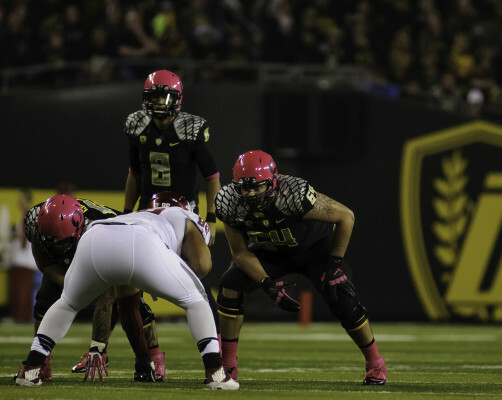 During spring ball, a lot of players have been acknowledging Jeff Lockie. Many say he looks great physically, his leadership abilities have taken a step to the next level, and he knows the offense unlike anyone else. Lockie has spent the last few years being the primary backup to Mariota. The two were very close, despite Lockie receiving little to no playing time. 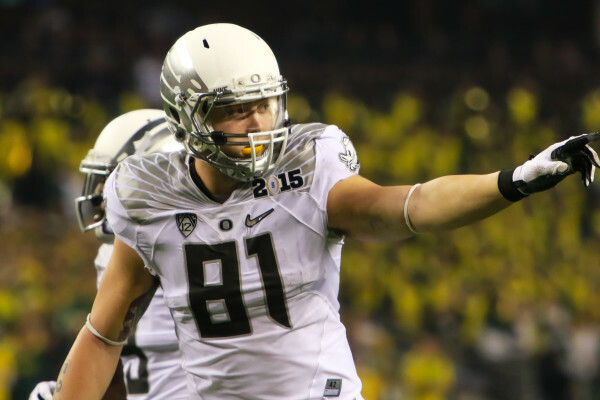 Even though he is smaller, and far less talented than Mariota, Lockie knows what needs to be done in order to succeed. Will Adams bring the same fire to the Ducks offense? Much like Mariota’s freshman year, expect stud quarterback Travis Jonsen to redshirt. This will limit the quarterback battle to one less. 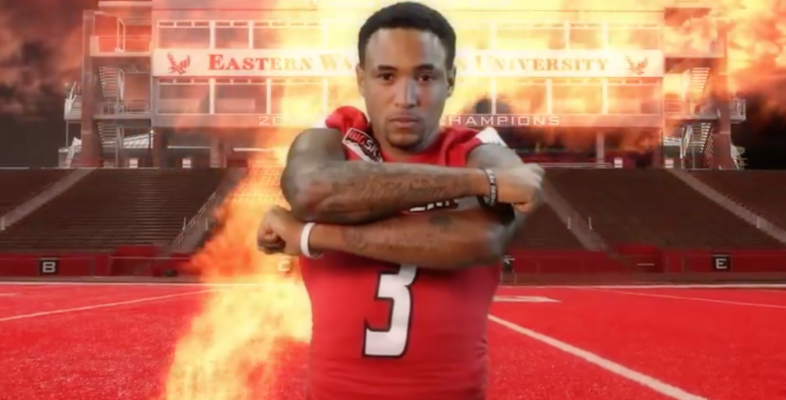 The guy who many feel could beat out Lockie for the starting gig this year is Vernon Adams. The Eastern Washington transfer must wait until after he graduates before he can come to Eugene and practice, potentially hurting his chances of outdoing Lockie. Adams is not too familiar with the offense but, it’s safe to say, materials regarding the offense have been provided to assist with his preparation. Adams has a boat load of talent, but being a little shorter then six feet raises red flags for some. Despite lacking size, Adams has a cannon for an arm, and can run very well if he needs to escape the pocket. While Lockie is the front runner right now, expect Adams to give him a run for his money. This should be an awesome battle. After reviewing what each position looks like for next season, it’s easy to say that the Ducks will have another high flying year on offense. Oregon is known for developing talent unlike any program in the country. With the amount of pure talent, the struggle will be making sure each player gets his chance to shine. The running back position is stacked unlike ever before, the offensive line is incredibly experienced, Baylis will be looking to show that he belongs as one of the country’s best tight ends, the wide receiver talent is sickening, and the quarterback battle will yield the guy that will take this team to the Promised Land. It will be another great year for the Ducks, as they look to make it back to the College Football Playoff. 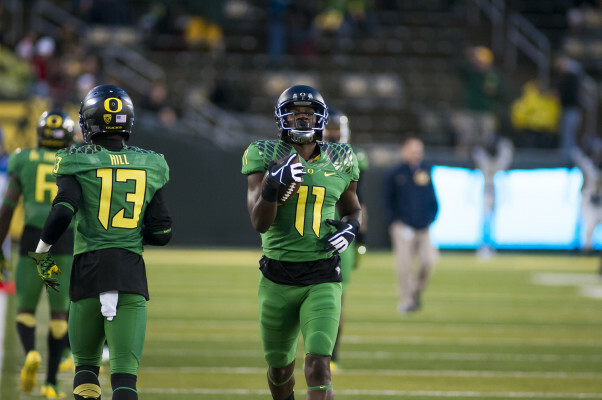 Stay tuned to FishDuck.com for the latest in Oregon Ducks news.